CEL & Associates, Inc. takes pride in our ability to facilitate the transformation of information into results. 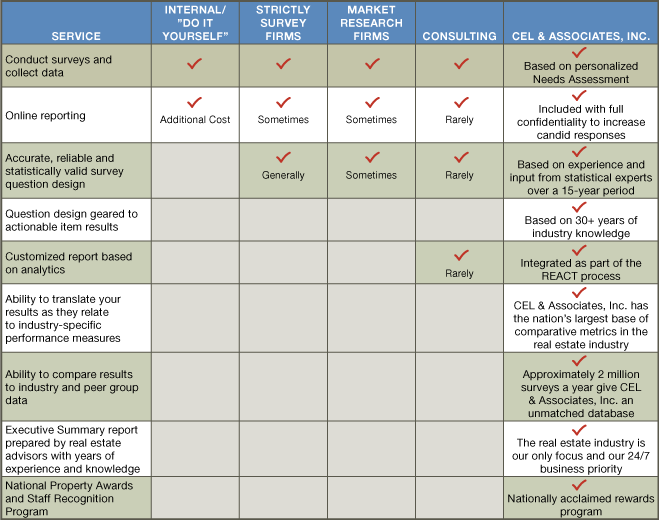 Our survey and reporting processes are considered to be the Best-In-Class solution for many real estate organizations. Before making a decision, it is very important to compare the differences. We offer Tenant Satisfaction Surveys, Resident Satisfaction Surveys, Client Satisfaction Surveys, and Employee Satisfaction Surveys. Take a moment to review the chart below, and you will see the “REACT Advantage” for all of your satisfaction survey needs.